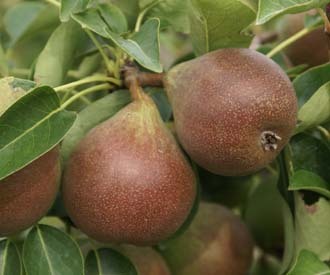 The sweet taste, subtle perfumed flavours and juicy texture of pears makes them the most prized and luxurious of fruits. 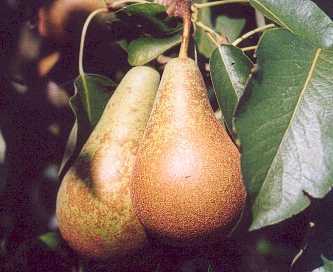 Pear trees are popular and widely grown garden fruit trees in the UK. However they are less ideally suited to the cool UK conditions than apple trees. While some varieties can be grown successfully in most parts of the country, in cooler regions many varieties are best only grown in warm, sunny, sheltered locations. 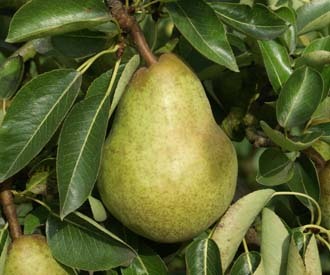 Here at Keepers Nursery we offer the widest range of pear trees for sale anywhere. We have as many as 100 varieties available for sale in any one year and we can produce many others to order from our own collection of over 120 varieties or from elsewhere . We have listed a relatively small range of our most popular and recommended varieties. You can see the full range by clicking on the relevant links below. 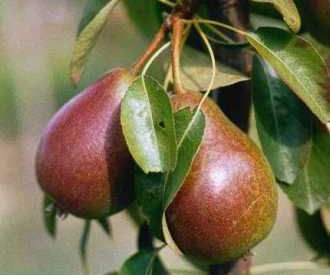 Click here for a guide to choosing pear trees. 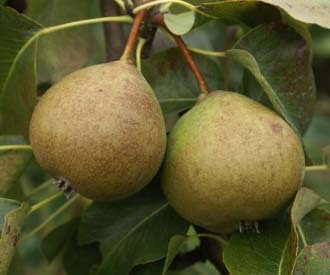 The season for early eating pears runs from mid August to mid September. In warm summers ripening can occur very rapidly and you need to be vigilant and pick the fruit before they are over-ripe and start to drop. Please find below 4 of the most popular and recommended varieties. We can offer a total of 42 varieties - click here. 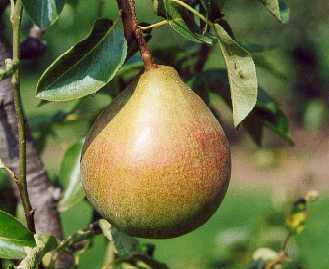 One of the earliest pears to ripen. It has good flavour and is a reliable cropper. A very old early dessert pear. A high quality sweet juicy pear. An attractive red skinned sport of Williams Bon Chretien. Probably the best known and most widely grown pear throughout the world. Mid season eating pears ripen from mid Septmeber to mid October. Some can be picked while still hard and stored in cold conditions to extend their season. Please find below 8 of the most popular and recommended varieties. We can offer a total of 59 varieties - click here. 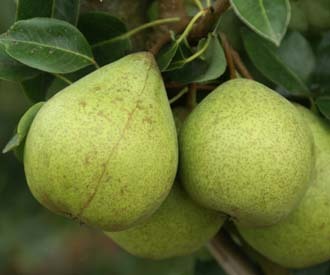 An attactive looking pear with good sweet flavour and reliable cropping. One of the finest dessert pears. Tender, juicy and sweet with a hint of rosewater. 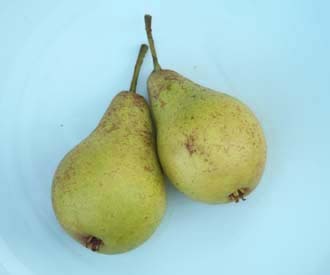 An excellent modern dessert pear similar to Conference and suitable for most locations. 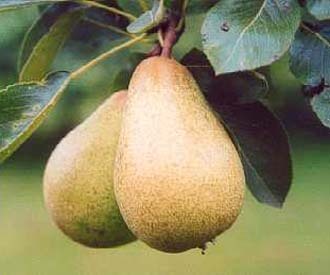 The most widely grown pear in the UK. Suitable for most locations and partially self-fertile. 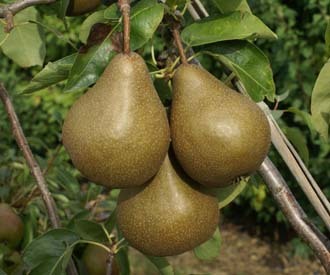 One of the finest flavoured and most popular commercially grown dessert pears. 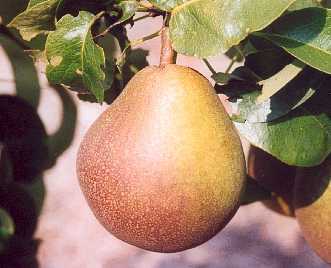 A stunning pear in the autumn with large golden fruit and crimson foliage. 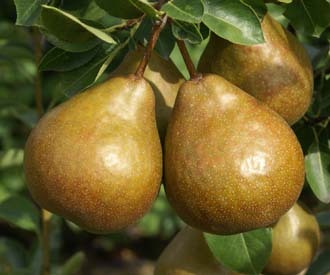 An attractive red flushed pear with a distinctive, slightly acid flavour. 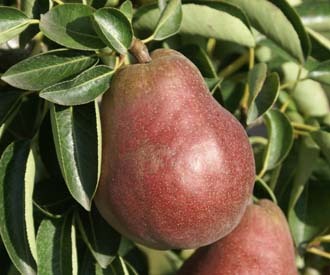 An Engish dessert pear not unlike Comice with excellent flavour and good reliable cropping. Late season eating pears are ready for picking by mid October. They can be stored and kept in cool conditions and ripenned indoors during the winter. Please find below 3 of the most popular and recommended varieties. We can offer a total of 35 varieties - click here. An excellent dessert pear but requiring warm conditions for best flavour. A good late dessert pear but requiring a warm location. A very good but quite small late dessert pear. Cooking pears fall into two categories. The first are eating varieties which are used for cooking. These are usually used for cooking before the soften. The second are old fashioned cooking pears which remain hard however long they are kept and never soften sufficiently to be eaten fresh. Please find below 3 of the most popular and recommended varieties. We can offer a total of 25 varieties - click here. An ancient and historic pear with very dark skin. One of the best traditional cooking pears. One of the oldest and best of the cooking pears. 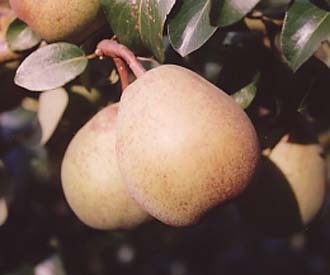 Perry is made by fermenting pear juice. It is the pear equivalent of cider. 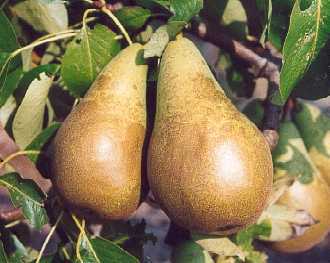 Perry pears are usually quite small. The high levels of acids and tannins that they contain help make good perry but also makes them unpalateable fresh. Please find below 4 of the most popular and recommended varieties. We can offer a total of 14 varieties - click here. 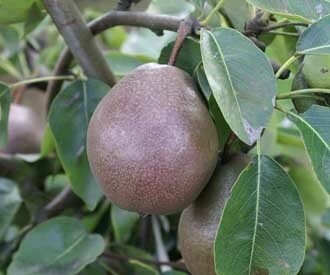 A traditional perry pear with small red flushed fruit. 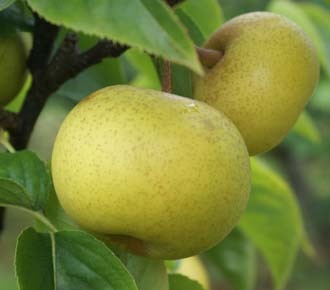 One of the best earlier season ripening perry pears. An old perry pear which has become highly prized with the revival of interest in artisan perry making. 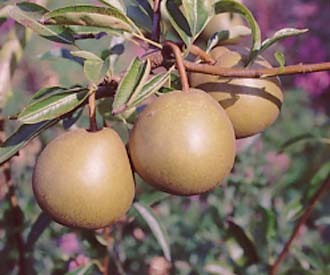 One of the most important pears used for making perry. 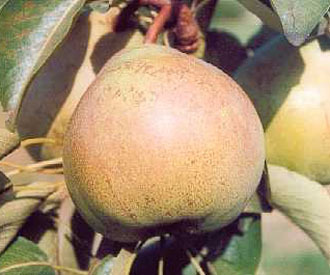 Asian pears are a from a closely related species to European pears Pyrus pyrifolia. They are round like an apple rather than pear shaped. Their flesh is crisp but very juicy. 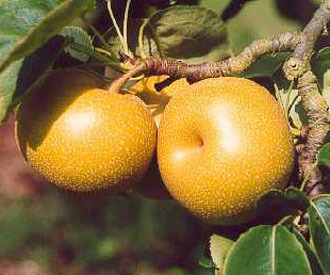 An Asian pear producing attractive golden russet fruit with excellent flavour and keeping qualities. 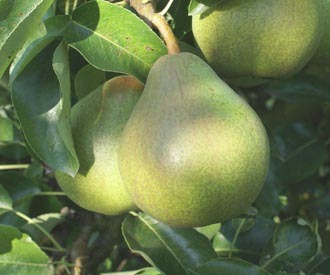 One of the asian pears most suitable for growing in the UK. 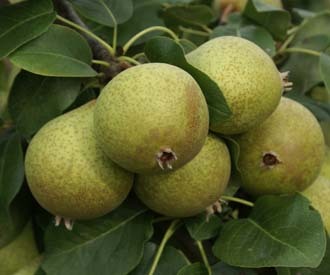 One of the best asian pears for UK conditions.